Holidays are important because they can be the only occasions when a family comes together. Joni is talking about an earlier time when she was a kid. 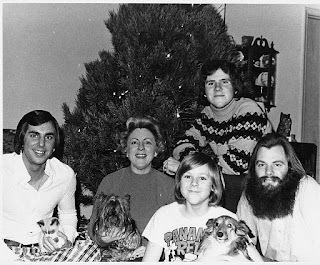 That got me thinking about our family’s Christmases. The Christmas tree has an interesting place in history. Evergreen trees, wreaths, and garlands were used to symbolized eternal life in ancient Egyptian, Chinese, and Hebrew cultures. In the Native American Hopi culture, the Morning Singers, Talavai Kachinas, appear in pairs standing on rooftops holding a spruce tree and ringing a bell as they sing songs to wake the village. In the Christian world, the Christmas tree has its origins in Germanic cultures. Martin Luther was said to have decorated an evergreen with lights. Lutherans brought decorated trees, the Weihnachtsbaum or Christbaum, into the home on Advent Sunday. That was December 3 this year. In England, King George III’s wife Charlotte of Mecklenburg-Strelitz decorated a tree for children in 1800, and Queen Victoria and Prince Albert each had a role in making a decorated evergreen part of Christmas in England. Christmas trees are usually conifers such as spruce, pine, or fir In Michigan, the Christmas trees were scots pine, blue spruce, and Fraser fir. In Florida, the trees were mostly pines from North Carolina. In California, we buy Douglas Fir and spruce. In 1958, Aluminum Christmas trees with a four-color rotating light became all the rage. In 1965, A Charlie Brown Christmas changed the way we view Christmas and Christmas trees. My family’s Christmas tree was by definition the one at my parent’s house. The tree my father bought and put up. The tree he and my mom decorated with three generations of family ornaments. The hundred-year-old donkey and cart and drum went on last. 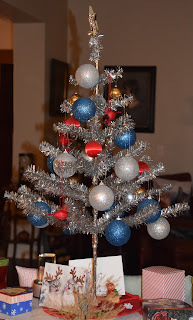 The family ornaments included glass bulbs, plastic space-ships shaped ornaments from the fifties, hand-crafted ornaments made by kids, and shell ornaments from Florida. Much later we added a glass pickle. My father was neither mechanical nor handy. He often bought trees that were too big. The trunk had to be cut and trimmed to fit in the tree holder and the top cut to allow for the fallen angel. Often Dad put the tree into the holder at an angle. Meaning our trees had a tendency to tip over. To avoid a tree accident, Dad took to wiring the tree to a wall, and a window or curtain rod using picture hanging wire. Rather than keeping the tree from falling, these safety lines resulted in holes in the plaster, broken windows, and torn curtains. In Florida my dad bought a tree stand that he pronounced, “the best stand ever.” I used the same stand for years until I purchased one in California guaranteed to hold a redwood up right. 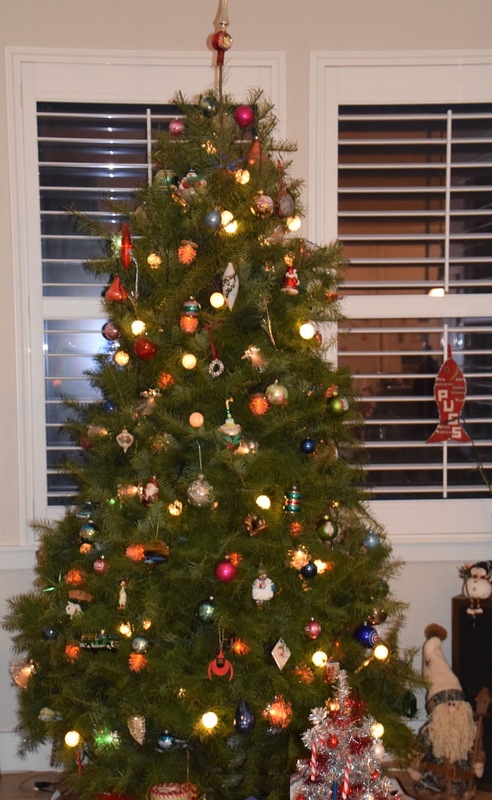 When my dad died, Lynette and I inherited the family ornaments and for a time the “family tree,” was determined by where my mother spent Christmas. This year with the passing of my mother, there is no one family tree, there are half a dozen family trees. Each of these trees has a few of the older family ornaments, fragments, from a century of decorating one family tree. For a time, our family was held together by my parents, by traditions like the family tree, and occasionally with the help of a length of picture wire. Now that my parents are both gone, I sometimes wish, too, I had a river I could skate away on.